PlayStation Mobile just launched for the Vita and PlayStation certified Android phones, but if you’re not in the very select group of certified devices supporting PlayStation Mobile you’re not out of luck; because anyone with a rooted Android phone can easily install PlayStation Mobile on their device. Make sure your phone is rooted; for many phones this is as simple as clicking a (virtual) button, for others it can be painful since it varies via device. Google will steer you in the right direction as long as long as you know the name of your phone/tablet. Enable non-market applications to be installed on your Android device. 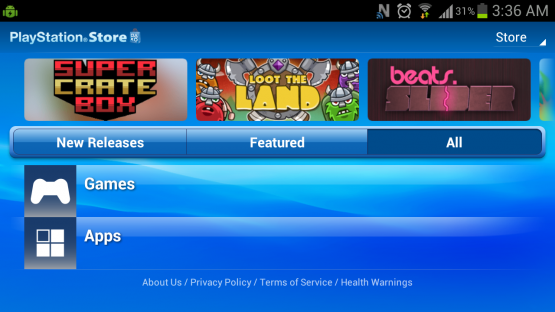 Download the PlayStation Mobile application, and this zip folder, move these files to your Android. Boot into a custom recovery, like ClockworkMod or TWRP. In ClockworkMod use volume keys to navigate and the power button to make selections – choose “install zip from sdcard” then either select “install zip from sdcard” or “install zip from internal sdcard” (depending on where you placed the zip file) locate the zip then install it. Reboot your device and install the PlayStation Mobile application by locating it with a file manager like ES File Explorer, or Astro File manager. Thanks to Google Play, Android owners have no shortage of cheap toilet titles to choose from, but I have a feeling this exploit will become invaluable as soon as PSM titles start arriving trophy equipped, plus having these purchases shared across your Vita and smartphone is a nice bonus. Is this hack working for you? Sound off in the comments below.